White shorts, with white drawstring, cut to an overlapping v-shape at the bottom of each seam. Thin navy blue line running diagonally from halfway down each side, then curves to join the edge of the overlapping seam, down to the hem, where it continues along the hem at the front. Curved red shard around the top of each seam, ending in a point at each end with two diamond shapes made up of diagonal navy blue lines, pointing downwards alongside each shard on the reverse. Two embroidered red concentric diamonds on left thigh. Red number, in the same font as on the shirt, above the Umbro logo on left thigh. Embroidered emblem on right thigh, with 'ENGLAND' in capitalised white lettering inside a navy blue panel above the emblem. 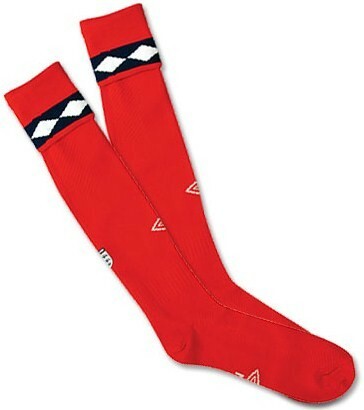 Red socks, with white diamonds on a navy blue hoop across tops. Two large white concentric diamonds on calf. Small emblem on reverse, with 'ENGLAND' in capitalised white lettering inside a navy blue panel above the emblem. England's captain, wore a white armband, with the fixture, the name of the stadium, and the date, all printed on it in navy blue, with the emblem also on it. A long-sleeved version of the shirt was also worn. The cuffs were red. The shirts worn by Ashley and Joe Cole also included their first initial i.e. A. COLE and J. COLE. 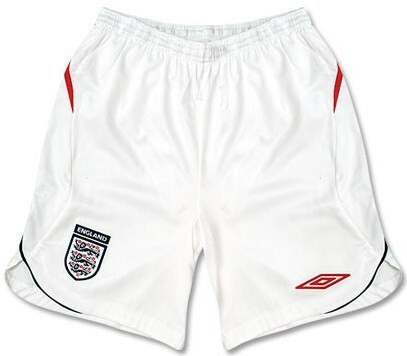 Against Andorra, England had the SOUTH AFRICA 2010 WORLD CUP QUALIFIERS logo embroidered onto the upper right sleeve, above the two diamond shapes. The names of England's opponents, as they appeared in the match details, were ANDORRA, FRANCE, GERMANY, SWITZERLAND and TRINIDAD & TOBAGO. England were named second in all but the first fixture, against Switzerland. Against France, David Beckham wore 100TH CAP in gold beneath the match details on the left breast and below the collar on the reverse, with a small English flag, bordered in gold, underneath. 32 players wore this shirt, in five games. David Beckham became the first outfield player to win 100 caps for England since Bobby Moore in 1973, when he took the field against France. 4 players won their first cap wearing this kit. Phil Jagielka had gone to win 40 caps by the end of 2016. Dean Ashton's international career only lasted until half-time on his debut against Trinidad and Tobago, when he was substituted. He retired at the end of the following year, aged 26, following an ankle injury. Michael Owen won his 89th and last England cap against France. Jenas' goal, the first for England under Fabio Capello, was his only international goal. Barry and Upson also scored their first goal for England in this shirt. Cole's two were both scored against Andorra, and they were his last two in international football, taking his final total to 10. When Fabio Capello became coach, at the beginning of 2008, he picked a different captain for each of his first four games, before eventually settling on Terry as his skipper. Beckham captained England for the 59th and last time, against Trinidad and Tobago. A shirt that was reminiscent of the 1982 red Admiral shirt, with its navy and white flashes across the collarbone, was worn only five times over a period of nine months, and marked the end of the distinctive Umbro style of the past eight years. Its debut, alongside that of England's new Italian coach, was shoe-horned into a friendly against the normally red-shirted Switzerland. According to Umbro, its twill mesh body fabric ensured that it was lightweight and breathable. If the design wasn't that original, at least fans of new technology could rejoice in the QR (Quick Read) code in the label of the replica version. Scanning it with their mobile phones enabled them to access a unique website for fans of Umbro and England. A truly momentous event. On the field, the players in this shirt performed well. It was memorable for David Beckham's hundredth appearance and it even saw a rare England away win in Germany, before the shirt was retired, perhaps a little prematurely, due to the fact that Nike had acquired Umbro and subsequent designs were about to go retro on a grand scale. 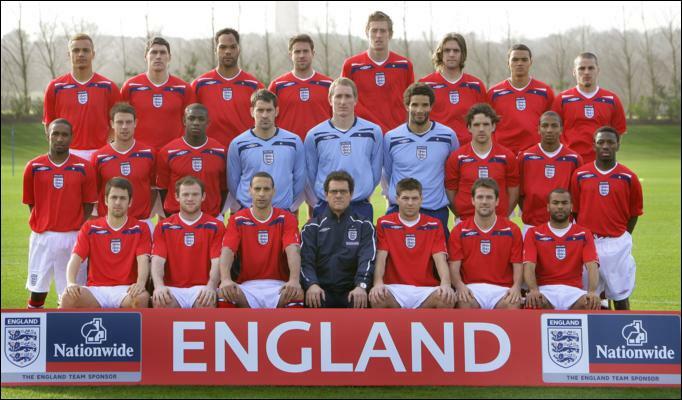 England were to go through 2009, without using a change kit at all. Thanks to Richard Clarke for the photo above of Michael Owen's number 20 shirt, issued to him for the Switzerland game. The shirt is from the 'Three Lions - England Match Worn Shirts' Facebook Collection.